Limited-overs cricket is a little different from the longer version. The skills, strategies and attitude required to succeed vary a bit from those demanded by the traditional variety. This is why some great Test players fail to become great one-day players and teams with fantastic Test records struggle in ODIs. Cricket is a game played as much in the mind as on the field, and it involves a 'comfort zone'. This comfort zone' is dependent on the strategies and beliefs of the team. Some teams, for instance India, believe that they are better off setting a target for the opposition and defending it. Batting first is their 'comfort zone'. On the other hand, some teams like the West Indies team of the 1970s and Sri Lanka of the mid-90s believe in sending the opposition in and restricting them to a low score. This word in limited-overs game means nothing but destruction for many batsmen - destruction of the bowler's psyche and the opposing team as a whole. But aggression without control and common sense is futile. Not everybody can be a Sehwag or a Gilchrist. Hence, other finer aspects of batting should be viewed. 1 : Taking quick singles. 2 : Running between wickets - judging a run. I cannot think of a better example than current Australian captain Ricky Ponting for proficiency in the first two areas. Not only is he quick between the wickets, but he is also a magnificent judge of a run. The art of Running between wickets is not only deciding whether you will reach the other end, but also determining whether your partner will make it. It's all about 'completing' the run, not merely 'taking' it. 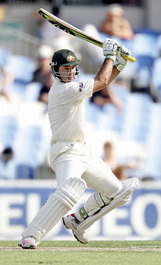 Mohammed Azharuddin was a class apart as far as placement and angle-creation was concerned. He was adept at leaving bowlers awestruck with his wristwork. A team batting first in an ODI should decide its strategy on the basis of its 'comfort zone'. There are only two fielders in the outfield in the first 15 overs. This means that if you have big-hitters in your ranks, then you can really benefit from going for the shots in the initial overs. But it is important to mix caution with aggression. Players who are fearless and possess the ability to hit over the top are invaluable for this gameplan. But a belligerent approach can be a risky one. It might give your team a flying start, say 100-0, but at the same time, if you play recklessly, there could be a collapse and the score could be a disastrous 40-4 after 15 overs. This strategy also depends on the type of players in the middle-order. If the middle-order is strong enough to weather the storm of early wickets and not get bogged down, then the risk is worth taking. The present Australian middle-order is a master at this. The Indian middle-order has also pulled off some rescue acts in the recent past, although not against Australia! An alternative to destructive aggression is 'passive' aggression; aggression in approach, running between the wickets, punishing the loose deliveries and capitalizing on the missed chances of the opposition. In this approach, the scoring graph will show a consistency, apart from probably the slog overs at the end of the innings. Followers of this approach believe that 50 overs is a long period. Conservation of wickets in the first 30-35 overs will ensure that the team has plenty of wickets in hand when the last 15 overs begin. This will enable the batsmen to go bang-bang, and a big total will be a foregone conclusion. Australia adopted this strategy in the 1987 World Cup, as did Pakistan in the 1992 edition. It is not a coincidence that both teams won! More often than not, teams play only four specialist bowlers, unless they have quality all-rounders. The part-time bowlers fill the fifth bowler's slot and bowl ten overs in the middle stages of the innings. The batting team naturally looks to attack these part-timers and score atleast 6-7 runs from their ten overs.